"Marshy Land Near Bimini Baths"
On May 31, 1906, Bimini Baths, near downtown Los Angeles, was botanized by the most famous California woman botanical scientist. Her name was Alice Eastwood, and she was curator of botany for the California Academy of Sciences in San Francisco. Miss Eastwood found 23 plants growing wild at Bimini Baths. Her hand written observations in her notebook state: "Marshy land near Bimini Baths, May 31, 06." The land was still natural enough, just 97 years ago, that if these native plants that Alice Eastwood found there could live, so could animals that fed on native plants, such as native aquatic insects, native birds, and native mammals. In addition, predators (reptiles, birds, mammals) would have been in the food chain. In essence, a natural wetland ecosystem occurred at Bimini Baths. Not today however, since it is an urbanized landscape with ornamental plants from other continents and animals such as mice, rats and cats from Europe, Asia, and Africa respectively. No native wetland mammals of American California occur there. Native wetland mammals such as the ornate shrew, meadow mouse, and harvest mouse no longer occur at Bimini Baths. There is always hope however since these mammals would be able to recover if a wetland is restored. Geographically, the Bimini Baths are located at the base of the Santa Monica Mountains, below Griffith Observatory, on a gently sloping alluvial plain. The high water table of the mountains intersected the plain, resulting in an artesian bubbling spring that was a warm mineral spring, a clear indication that an earthquake fault played a role in the formation of the natural landscape at Bimini Baths. Only a few hundred yards downstream from Bimini Baths is the Sierra Club office on Wilshire Boulevard, where a native plant called Narrow-leaved Cat-tail was documented to have lived until 1917. The maps indicate that a stream from Bimini Baths flowed toward the Sierra Club offices. Telltale signs of this landscape are still noticeable today because Wilshire Boulevard makes a dip in the road between Normandie Avenue and Mariposa Street where that stream known as Sacatella Creek flowed on its path to Rio Ballona, and then further down to the sea at the estuary known as Ballona wetlands at Playa del Rey. It would be a unique experiment in restoration to attempt to "day-light" this buried stream, as well as daylighting a portion of Ballona Creek. It now becomes clear that Bimini Baths, Wilshire Boulevard, and Sacatella Creek are in the Ballona watershed. In essence, we have a situation of several places of "old" LA connected by a "river" running through it. And actually, West Hollywood, Beverly Hills, and UCLA-Westwood are also part of the Ballona watershed. Future research will reconstruct the elements of the native fauna and also the animal ecology, but this preliminary report focuses on the native plants that Alice Eastwood collected at Bimini Baths. At this point in the research, I am aware of 23 plants that Alice Eastwood collected on May 31, 1906. I have located her field notes at the herbarium library in San Francisco at the California Academy of Sciences (CAS). Now the hard work will begin of searching the vouchers to find her specimens, so the complete scientific name can be learned. Once the scientific name is known, a better assessment of the ecological landscape at Bimini Baths can be discerned. However, a preliminary analytical statement can be made at this time: A genuine natural wetland occurred there since 19 of 23 plants, or 83% of the plants are wetland ecosystem indicators. 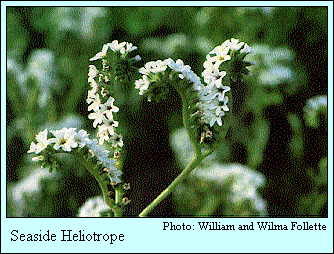 Four of the 23 plants are upland prairie indicators. So in an ecological analysis, the Bimini Baths wetland was surrounded by a wildflower prairie. There is enough ecological restoration knowledge now available at this time that we are ready to begin to place some of the genuine (appropriate) native plants at Bimini Baths, when we are ready to allow some of the subterranean water come back to the surface to see "daylight" at Bimini Baths. The research that is still needed at the California Academy of Sciences is to look at each voucher specimen, record the CAS voucher number, find the current name, and any additional notes or observations that Alice Eastwood wrote on the voucher. At this time, I have looked for and found voucher specimens for #86 (Yerba Mansa), #100 (American Bulrush), and #103 (Alkali Heath), collected by Alice Eastwood. There are 20 voucher specimens remaining to look at. Some of them can be found quickly, but other will require some time and effort due to name changes so that a laborius detective search will be required. This research needs both time and funding to be completed. Airfare to San Francisco and a rental car are the expenses needed to complete this research. I visited Bimini Baths in 2001 and 2002, which is predominantly covered in cement, asphalt, stores, and auto-repair shops. Nonetheless, to a restoration ecologist there is are some promising locations to plant native plants that Alice Eastwood found there in 1906. For example, there are homes with gardens and some open space near the school and church where restoration and recovery could begin. I could not locate any relict populations of native plants at Bimini Baths, so we must start over again in restoration by planting species such as Seaside Heliotrope and Yerba Mansa in a garden or yard there. I have several Seaside Heliotrope and Yerba Mansa growing in pots at my garden that are ready to plant at Bimini Place-Baths. Fortunately, there is interest by members of the local community, led by Lois Arkin of LA EcoVillage and by Joe Linton of Friends of the LA River, to restore and recover the native plants that would have occurred naturally at Bimini Baths and Bimini Place 100 years ago. Preliminary List of Plants Found by Alice Eastwood at Bimini Baths on May 31, 1906 No. ... Scientific Name ... Vernacular Name ... Habitat Indicator Status ... Museum # ... "Eastwood Quote"
82 ... Lupinus sp. ... Lupine. Upland prairie indicator. 83 ... Muhlenbergia sp. ... Muhly Grass. Wetland indicator. 84 ... Polypogon monspeliensis ... Rabbit-foot Grass. Wetland (facultative) indicator. 85 ... Azolla filiculoides ... Duck Fern/Water Velvet. Wetland (obligate) indicator. 86 ... Anemopsis californica ... Yerba Mansa. Wetland (obligate) indicator. "Bimini Baths." CAS 112251. 87 ... Rumex sp. ... Dock. Wetland indicator. 88 ... Rumex sp. ... Dock. Wetland indicator. 89 ... Apium graveolens ... Wild Celery. Wetland (facultative wet) indicator. 90 ... Myriophyllum sp. ... Water Milfoil. Wetland (obligate) indicator. 91 ... Centromadia sp. (Deinandra) ... Southern Tarplant(?). Wetland indicator. 92 ... Amsinckia intermedia ... Fiddleneck. Upland prairie indicator. 93 ... Microseris douglasii ... Douglas Microseris. Upland prairie indicator. 94 ... Castilleja sp. (Orthocarpus) ... Owls Clover. Upland prairie indicator. 95 ... Heliotropium curassavicum ... Seaside Heliotrope. Wetland (obligate) indicator. 96 ... Verbena sp. ... Verbena. Wetland (facultative wet) indicator. 97 ... Atriplex sp. ... Saltbush. Wetland (facultative) indicator. 98 ... Ludwigia sp. (Jussiaea) ... Water Primrose. Wetland (obligate) indicator. 99 ... Urtica sp. ... Nettle. Wetland (faculative wet) indicator. 100 .. Scirpus americanus ... American Bulrush. Wetland (obligate) indicator. CAS 104425. 101 .. Suaeda sp. (Samphire) ... Sea Lite/Sea Blite/Seep Plant. Wetland indicator. 102 .. Arthrocnemum subterminale (Dondia) ... Pickleplant. Wetland (obligate) indicator. 103 .. Frankenia salina ... Alkali Heath. Wetland (facultative-wet) indicator. CAS 49891. "Near Bimini Baths." 104 .. Nasturtium officinale ... Water Cress. Wetland obligate indicator. 105 .. Hydrocotyle sp. ... Marsh Pennyroyal. Wetland obligate indicator.